Dressed as Pippi Longstocking for my literary birthday party! October has been a very productive month. I’m so busy making my dreams come true that I have been away from posting anything in almost three weeks! I guess this is also what happens when you have an actual job to go to. Yay library job! In being forced to work as a waitress, a valet attendant, an executive assistant, a “background artist,” then be further humiliated and disappointed by endless people at these jobs, I learned the important lesson…to just stop doing them!!! Or kill myself, but that wasn’t an option because like my party, I was worried that nobody would come to my funeral either. Instead, I decided to go into debt by focusing my energy back to the library whether they were going to pay me or not. By depending on myself and having true excitement and passion for the work I was doing as a volunteer with the library, (not to mention having few friends left to distract me with actual fun), I ended up accomplishing far more than I ever imagined. I met Steve-O. The end. I kid, I kid. Seriously, Steve-O should be happy he met me and I had the time to issue him a library card because that’s the smartest thing that “Jackass” has ever done. My point with this post is that I finally work with really cool people in an awesome library that I love and I am paid to be there. While I am not officially a librarian yet, I am treated with the same respect as if I were. For example, just the other day a patron said that our library has too many stairs and that I am too skinny and should gain some weight. I almost cried. It was only a year ago that I was just a waitress wanting to work at the library and here I was…unable to accidentally drop her food in her lap. Listen folks, life will give you lemons and you could make lemonade but I say keep your dang lemons. I prefer carrots. I made a reference to killing myself but suicide is never the answer, the library is. It has saved me on numerous occasions. Unlike people, the library will always be there for you even when you feel you have nothing else. Information will always make you stronger. Trust me. with a dance at the House of Blues. Hallelu-yeah life is pretty great! Stand-Up Librarian Meredith Myers Issues Steve-O His First Library Card. LOS ANGELES (October 3, 2011) – Stand-Up Librarian Meredith Myers issued “Jackass” star Stephen “Steve-O” Glover his first library card while at the new West Hollywood Public Library on Sunday. Steve-O was appearing at the 10th Annual West Hollywood Book Fair promoting his new book Professional Idiot: A Memoir. Myers works at the library and was performing literary stand-up comedy on the theater stage. Myers had previously interviewed Steve-O on WHBF Radio and encouraged him to apply for his first library card. Steve-O was one of 783 people to apply for library cards at the new West Hollywood Public Library during Sunday’s West Hollywood Book Fair, which is in addition to the 500 applications at Saturday’s grand opening ceremonies. Steve-O recently made headlines for his appearance on Comedy Central’s “The Roast of Charlie Sheen” where he intentionally ran into Mike Tyson’s fist and received two black eyes and a broken nose. In addition to appearances promoting Idiot, Steve-O is currently on a stand-up comedy tour. Myers, a librarian and comedian, has been educating and entertaining people about the importance of libraries. 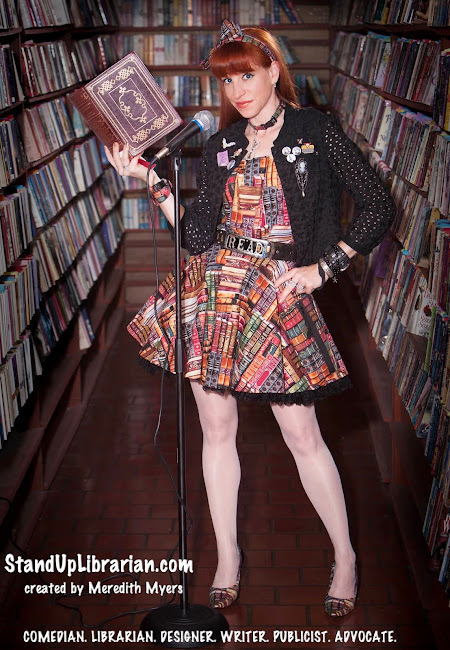 Myers has a Masters degree in Library and Information Sciences and has been performing stand-up comedy since 2002 after checking out a comedy book from her local library. Binding her experiences in comedy and libraries, Myers created www.StandUpLibrarian.com in an effort to showcase how varied, fun, and vital libraries are to our current society and intends to bring an awareness to the often-stereotyped library field revealing that librarians are as diverse as the libraries themselves. Through interviews with experts and authors, tours of unique libraries across the country, library and literary-specific stand-up performances and sketches, not to mention plenty of book recommendations, Myers’ unique perspective and humor is perhaps just what libraries need in a tough economic time where city budgets seem quick to eliminate them or reduce staffing. A former-publicist who enjoys promoting all things literary, Myers has spent the past week interviewing authors/artists appearing at the WeHo Book Fair on WHBF Radio. Below is the interview with Steve-O.